Great Bardfield 9th hosted CFC Shalford 8th and shared the points in a 2-2 draw which moves CFC to 7th place. Great Bardfield’s goal scorers were Matthew Potter & Adam Daniels and CFC Shalford’s goal scorers were Laurence White & Ed Foy. Nags Head Celtic 4th hosted Great Notley 10th and the home side won 3-1. Both teams stay in the same position. Nags Head Celtic’s goal scorers were Pete Falco, Andy Hughes & Rory Bone and Great Notley’s goal scorer was Dean Wiffin. Witham United 7th hosted Flitch United 3rd and the home side won 3-2 and move up to 5th place. Witham United’s goal scorers were J. Merton 2 & S. Barrett and Flitch United’s goal scorers were Billy Skinner & Benn Hayward. 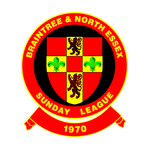 Braintree Legends 5th hosted Onley Arms 10th and the home side won 2-0 which means both teams stay in the same positions. Braintree Legends goal scorers were Arron Boyd & Ben McGlashen. Panfield Bell 4th hosted Dunmow Rhodes 3rd and drew 3-3 and stay in the same positions. Panfield Bell’s goal scorers were Lewis Sennox, Ryan Gilbert & Adam Clark and Dunmow Rhodes goal scorers were JP Alexander & Kennie Irving 2. This match was a six goal thriller between two sides who are in the mix for possible promotion this season,Dunmow Rhodes sit in third place and Panfield Bell are in fourth spot.The first half was quite even with both sides playing neat passing football but not creating many chances,and it was late into the first half that Dunmow Rhodes took the lead when JP.Alexander sent in a brilliant free kick that gave Panfield Bell keeper Arron Bridge no chance to save making the score line 0-1 at Half Time.The second half was more action packed,and Dunmow Rhodes hit there second goal,when good play by Charlie Gooch set up Kennie Irving to score a well taken goal.Panfield Bell pulled a goal back,from a corner kick,with the ball hitting the post and the rebound falling to Adam Clark to nudge the ball past Dunmow Rhodes keeper Luke Johnson. Panfield Bell drew level from a goal by Lewis Sonnex,and for the first in the match Panfield Bell took the lead,when a good pass found Ryan Gilbert in space,and his shot flashed past keeper Luke Johnson to make it 3-2. Dunmow Rhodes hit back quickly when more good play by Charlie Gooch,his cross found Kennie Irving who scored his second goal of the game to make it 3-3.It was now a very interesting last five minutes,with both teams having chances of winning the game,but the match eventually coming to an end with the Final Score 3-3.Man of the Match for Dunmow Rhodes was Reece Cottrell who had an excellent game in the back four,cutting out the Panfield Bell strike force. Tiptree Elite 1st hosted Notley FC 10th and the away side won 1-2 to move up to 9th place. Tiptree Elite’s goal scorer was Tommy Gregory and Notley FC’s goal scorers were Joe Russell & Jamie Sutton. Notley took on top of league 1 unbeaten Tiptree Elite today finally Notley played as I know they can with Notley winning 1-2 goals scored by Joe Russell Jamie Sutton excellent effort from my team. Great Bradford Reserves 4th hosted Witham White Horse 8th and drew 2-2 which sees the home side drop to 5th place. Great Bradford Reserves goal scorers were George Shearer & Owen Gray and Witham White Horse’s goal scorers were Rob Bennett & Ryan Kehoe. Manor Works 2nd hosted Heybridge Harriers 3rd and the game was a 1-1 draw and both teams stay in the same positions. Manor Works goal scorer was Adam Starckey and Heybridge Harriers goal scorer was Evan Davis. Tiptree Jobserve Reserves 6th hosted Finchingfield Rovers 7th and the home side won 2-0 and move up to 4th place. Tiptree Jobserve Reserves goal scorers were Miles Harvey & Lewis Wollington. Tolleshunt Knight Eagles 9th hosted Witham Phoenix 10th and the away side won 5-1 but stay 10th. Tolleshunt Knight Eagles goal scorer was Brett Melia and Witham Phoenix’s goal scorers were Kieran Musto, Fabrice Williams, James McLaughlin, Gerard Roulston & Richard Nial. Western Arms hosted Braintree Iron and the away side went through with a 0-1 win. Braintree Irons goal scorer was N. Stackhouse. Braintree Iron edged past Western Arms 0-1 to set up a semi final tie against CFC Shalford in the Andy Livermore Premier Division Cup. The game was closely contested throughout with The Iron having the better of the first half and Western coming back strongly in the second period. This was largely to do with the sloping pitch and strong wind conditions which made life difficult for both sides to produce their best Football. In the end the Iron defensive unit proved decisive with yet another clean sheet. Nick Stackhouse was the Amber and Blacks goal scorer capping an impressive display with a well taken individual effort. The Managers nomination for MOTM was Jamie Gray who dominated the middle of the park. Bocking Eagles hosted Sporting 77 with the game ending 1-1 after extra time and went to penalties. Bocking Eagles won 6-5 on penalties. Bocking Eagles goal scorer was Tom Garnham and Sporting 77’s goal scorer was Thom Scotting. Notley Reserves hosted Tiptree Jobserve and the home side won 5-2 to beat the higher league opposition. Notley Reserves goal scorers were Callum Farrell 4 & Ben Ager-Hutton and Tiptree Jobserve’s goal scorer was Scarlett 2. A great cup game here saw tiptree score in 20 seconds, notley battled hard, Callum Farrell was one on one with the keeper to equalise then a great great free kick by Scott Collins was met by Farrell to take notley into the lead tiptree then draw level Farrell completed a hatrick before half time to see notley go in 3-2 up, a fast start from tiptree was defended well by Chris Collins, Darren Douglas and harry phillip and some good saves from gavin woolfenden kept notley ahead then Ferrell grabbed a fourth before ben agar-Hutton got his first for the season to complete the result.